A little more please! 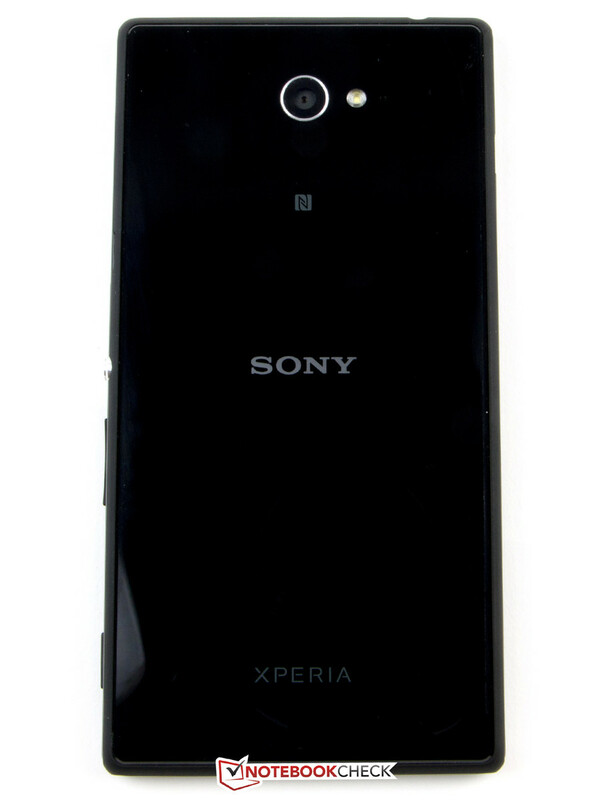 Second round for the Sony middle-class device: The model has gotten bigger and is designed similar to the flagship, the Xperia Z2. However, the manufacturer has removed some of the flaws we pointed out in the predecessor: The quality of the display has improved as has the storage space. The Sony Xperia M2 is a middle-class smartphone. It has a few distinct improvements over the predecessor and the most noticeable change is the bigger display, which has grown from 4 to 4.8-inches. The design orients itself to that of the flagship of the series, but it does not employ the same high-quality materials and is not IP-certified. 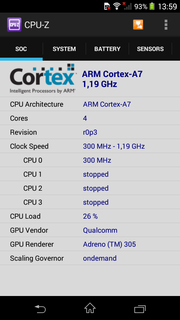 The processor of the smartphone runs 200 MHz faster and has two more cores. 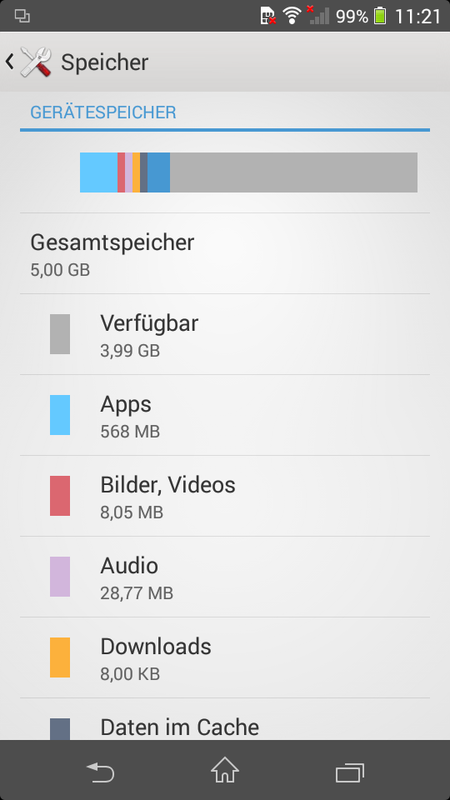 The internal storage has been doubled, which is good news as the small memory of the predecessor was a serious flaw. 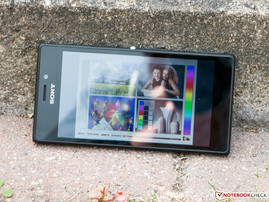 The Sony Xperia M suffered from flaws in the display, modest webcam and weak CPU. The competition is vast: the HTC Desire 610, the Acer Liquid E3, the LG G2 Mini and the Samsung Galaxy Core LTE. Furthermore, the test model has to prove its worth against stronger competitors from the Far East such as the Zopo ZP1000, which belongs to the same price class. A glass panel adorns the back. SIM- and MicroSD slots are covered by their respective flaps. 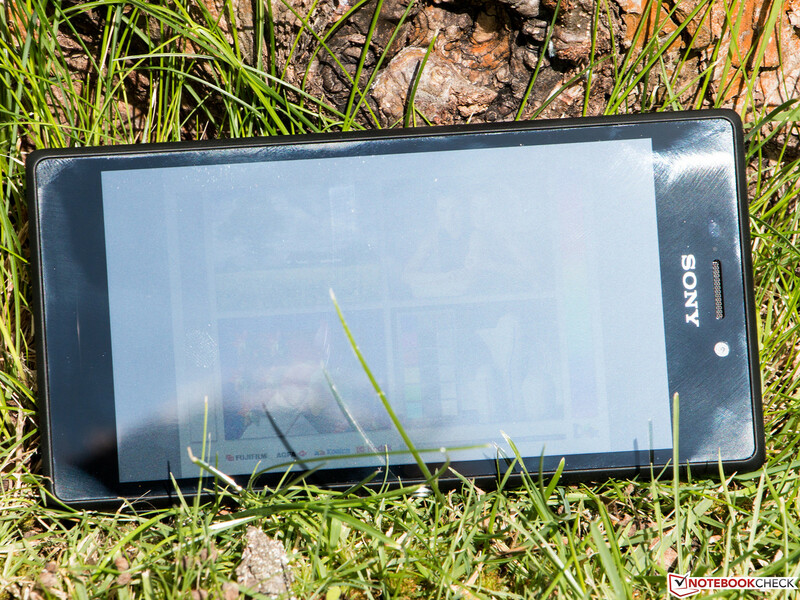 The case of the Sony Xperia M2 is made of synthetic material and weighs 149 grams. The device measures 8.6 mm and is comfortable in the hand. The side borders are small, but the upper and bottom borders are a little wide. The back is covered by a glass panel, which looks good, but it is a magnet for fingerprints and smudges. The device is sturdy. Pressing on the case results in a quiet creaking and causes slight distortions on the display. Strong pressure on the back can result in visible alterations in the panel. 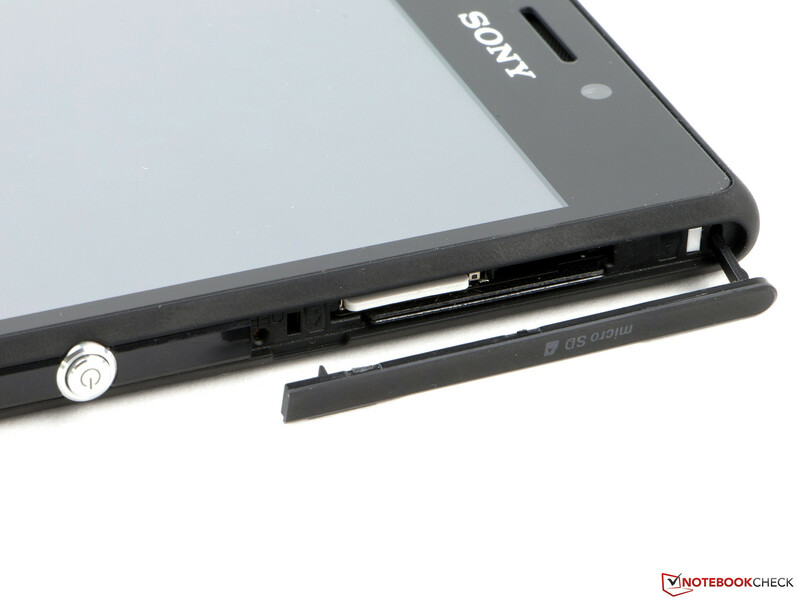 The battery of the Xperia M cannot be removed as the case of our test model cannot be opened. The long notification LED from the predecessor can be found in our test model as well and it can be configured to light up in different colors. When turned off, it is practically invisible. 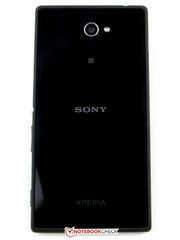 The ports of the Sony Xperia M2 have stayed same to those of the predecessor. The USB-2.0 interface can be used to charge the device or transfer data from a computer. MHL is not supported but OTG is, which means external storage and input devices can be connected. If the M2 is connected to a PC, the device offers the user the option of installing a PC suite. The MicroSD card reader supports memory cards up to 32 GB. The Ant+ connection standard for wearables is also supported. 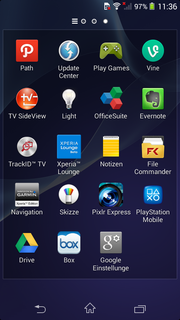 The operating system is Google Android 4.3 Jelly Bean, which is customized with Sony's own UI. An update to Android 4.4 KitKat is planned but a release date has not been determined. The Xperia M2 is quite secure. 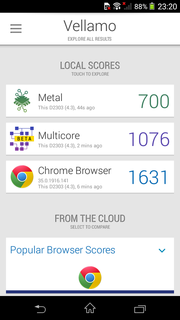 We could not detect any harmful software on the smartphone using standard detection tools. 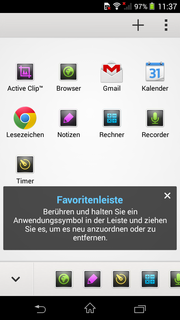 The App2SD function is not supported by the device which means that the installed applications cannot be moved over to the MicroSD card. 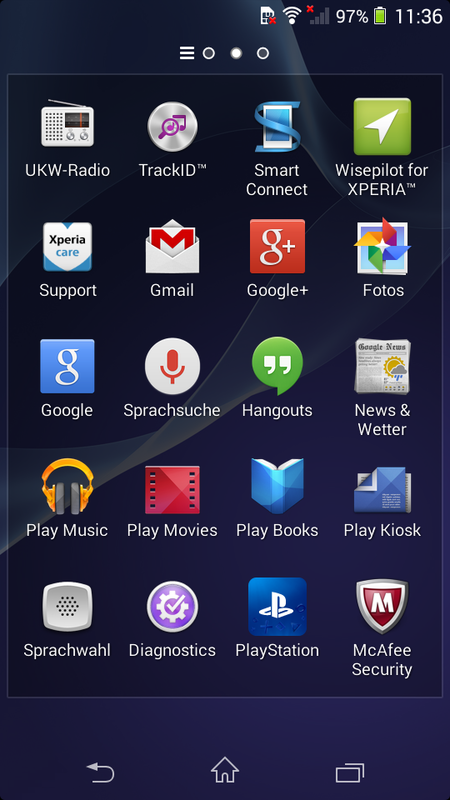 The Sony Xperia M2 runs on Google Android 4.3 Jelly Bean. In terms of communication, the Sony Xperia M2 is well-equipped. The WLAN module supports the IEEE-802.11 standards a/b/g/n and operates on the 2.4 and 5.0 GHz frequencies. The range is very good. 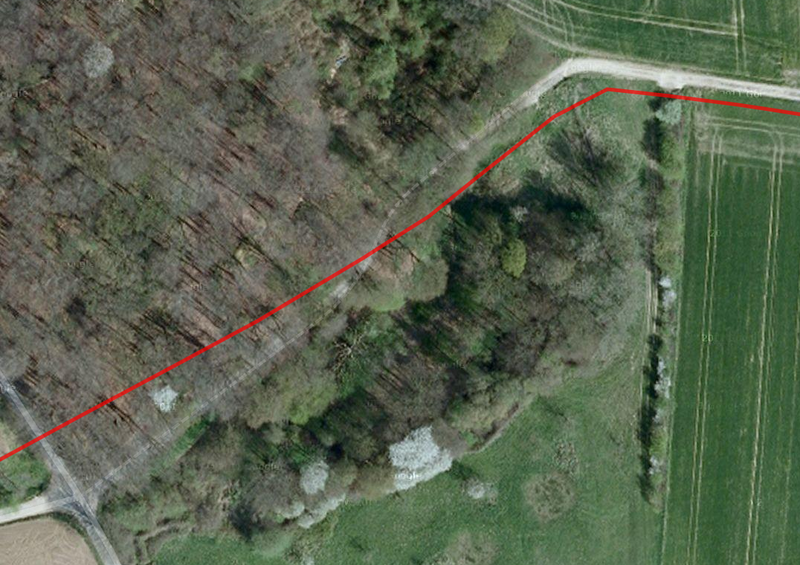 On a 2.4 GHz frequency, we could go up to 20 meters without any disturbance in the connection. 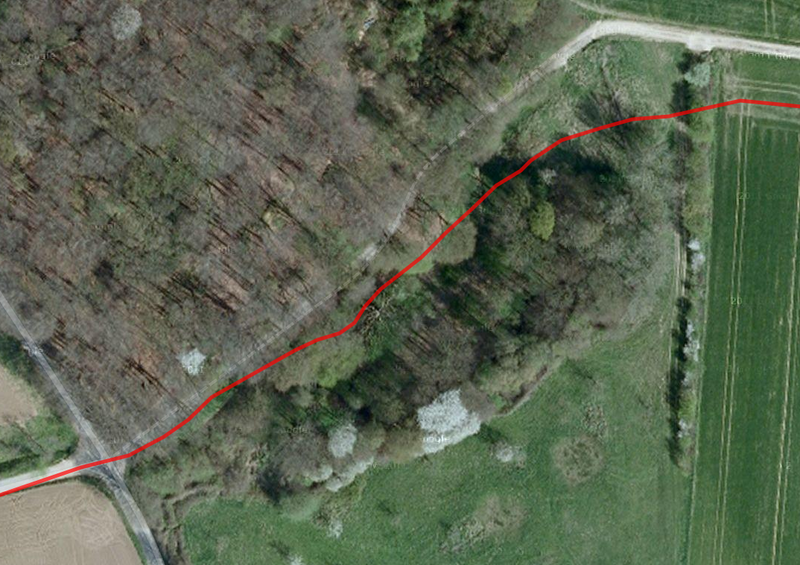 The signal strength of the router (Fritz!Box 6360) was -69 dBm at this distance, which is quite strong. The range on the 5 GHz frequency is definitely larger. These mobile data standards place the test model at the cutting edge of technology and on par with competitors. HSPA+ and LTE Cat. 4 are supported. The latter allows download rates up to 150 MB/s. 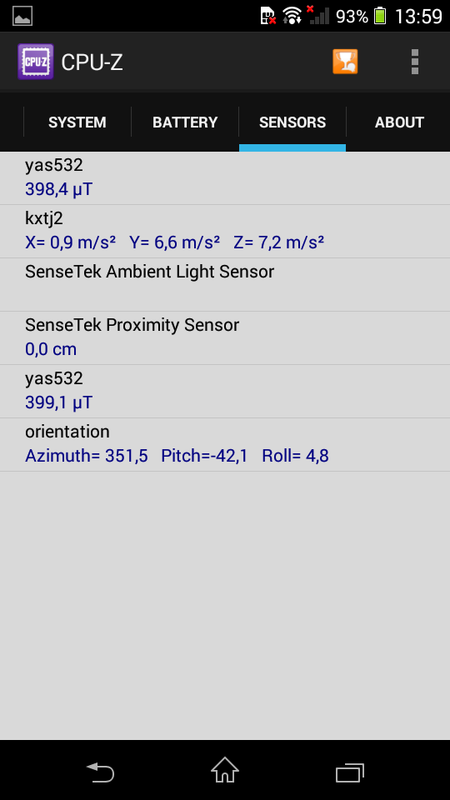 The frequencies supported are also extensive, meaning that the smartphone should have no problem connecting to a network. Streaming music via Bluetooth 4.0 works without issues. If you want to watch videos from the web in HD quality, you will notice that the sound is not synced with Bluetooth speakers. NFC is on-board. 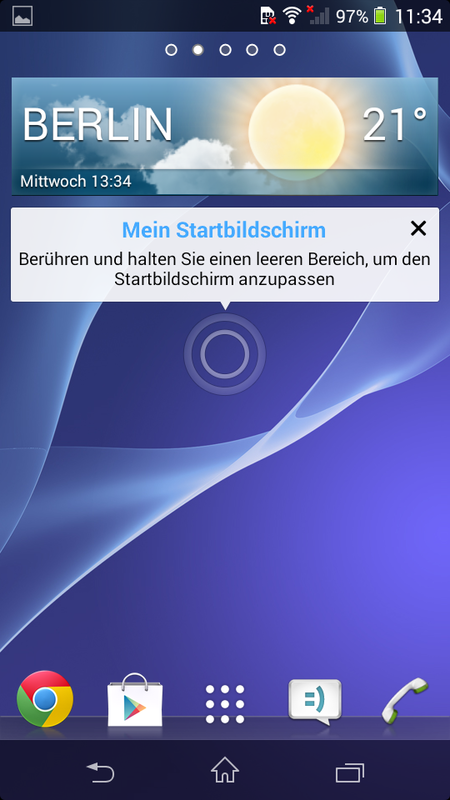 The Sony Xperia M2 supports GPS and Glonass. 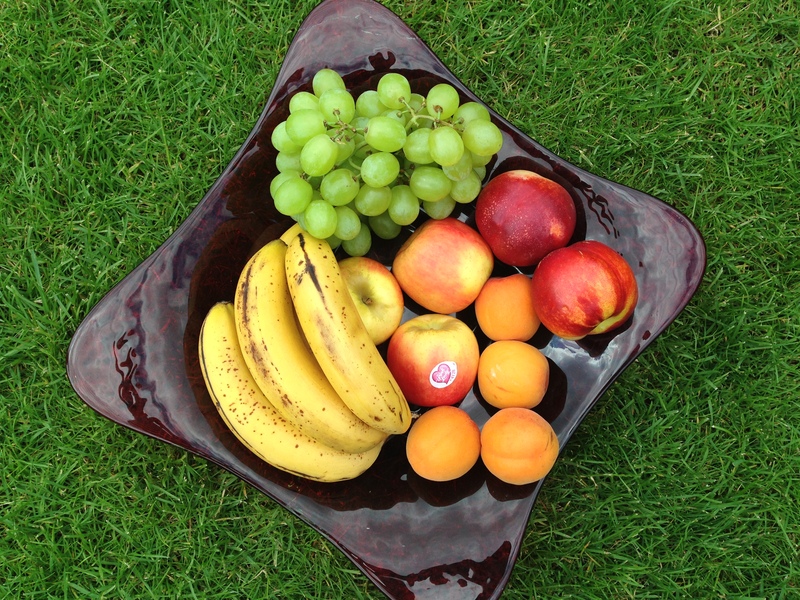 A Sat-Fix is quickly established outdoors and even indoors it takes a mere few seconds. 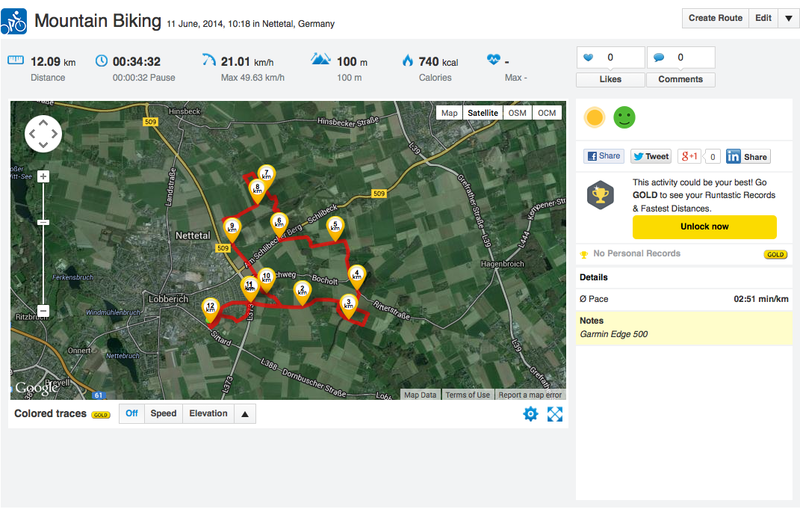 In a comparison with the Garmin Edge 500, we checked the accuracy of our test model. The test model is relatively accurate and gives us a positive impression. 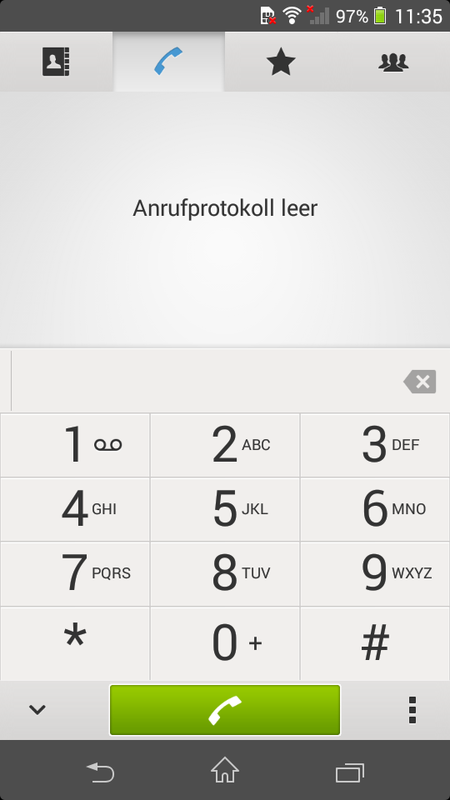 The telephone app is simple and clean. The acoustics are similar to those of the predecessor. If we hold the device to our cheek, the recipient can hear us well, but we come across as tinny. The speakers show a similar behavior, accompanied by small speech distortions. The headset included in the delivery is surprisingly good. With it, we believe the phone has the best speech quality. Although we still sounded a little dull, our audio was understandable. 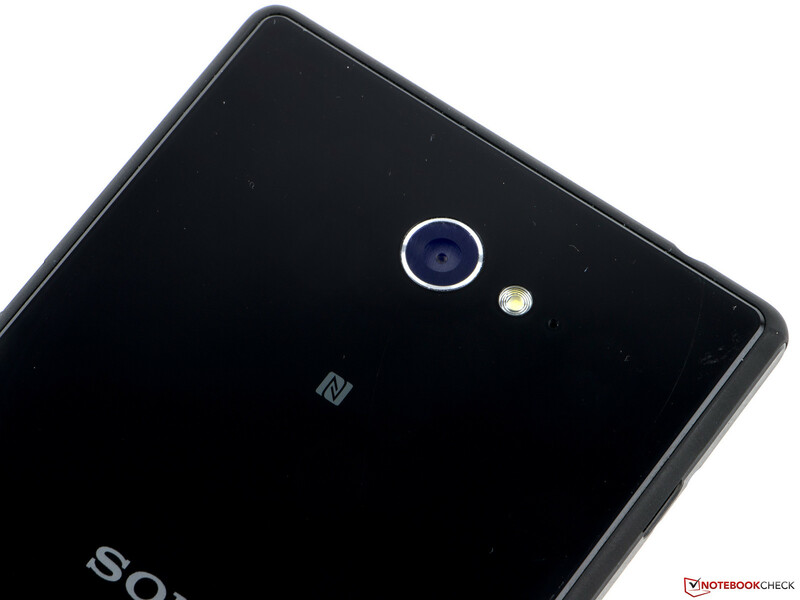 The Sony Xperia M2 has two cameras. The webcam on the front is quite small and has a mere 0.3 MP to offer. This is the same as the predecessor, but the camera pictures have far better quality and are relatively sharp. It may not be good enough for selfies, but it is sufficient for Skype. The main camera has been reworked and now has a resolution of up to 8 MP (3264x2448 pixels, 4:3). This is only available in manual mode, but when the user starts the camera app, the automatic mode is chosen as default. 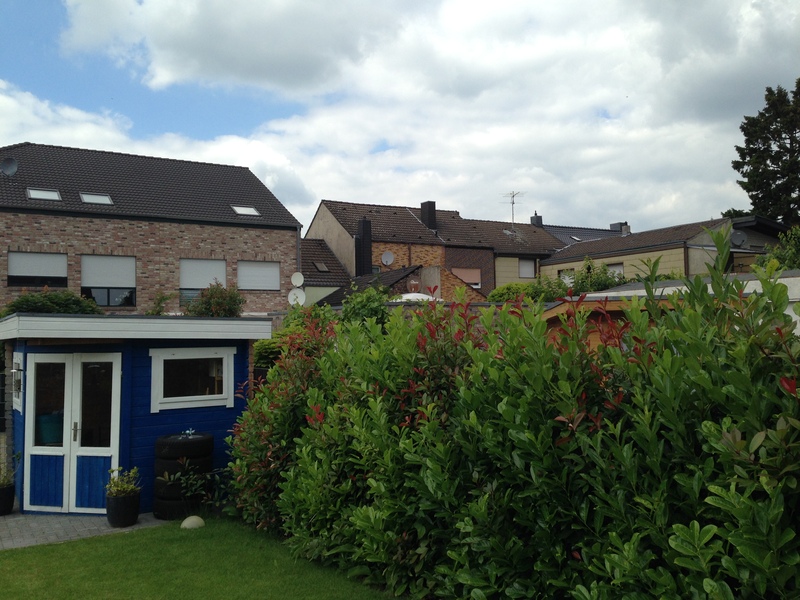 This mode operates at 5 MP (3104x1746 pixels, 16:9) and reserves the extra 3 MP for digital zoom. The camera interface is well thought-out: the volume rocker can be used to zoom and a button for the camera is also included. 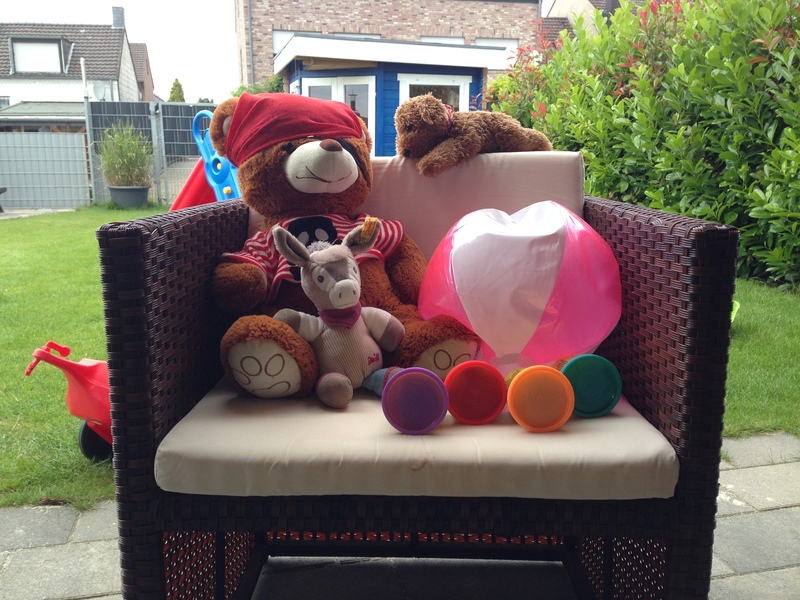 The camera can use many different effects, including HDR. The quality of the recordings leaves many desires unfulfilled: the photos are not sharp enough and details look washed out. Even in good lighting conditions, artifacts are easy to find. The photos always seem to be slightly oversaturated, which leads to the colors appearing pale. In poor lighting, the picture is easily distorted. 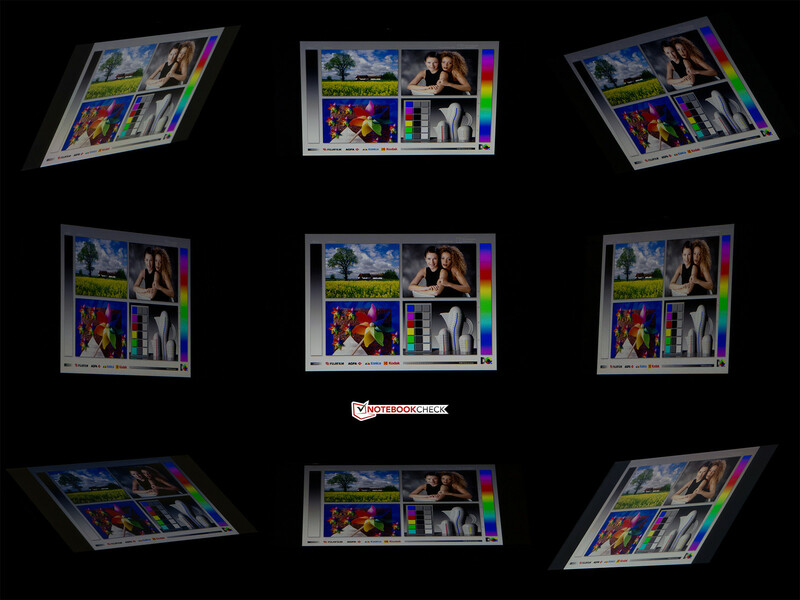 The integrated picture LED allows us to produce reasonable images. Videos can be recorded in Full HD (1920x1080 pixels). Weak lighting strongly affects the recordings and the auto-focus has to adjust multiple times even if the camera is moved slowly, leading to visible Push effects. Overall, the main camera did not give us a good impression but we believe that a software update can do much to improve the camera. 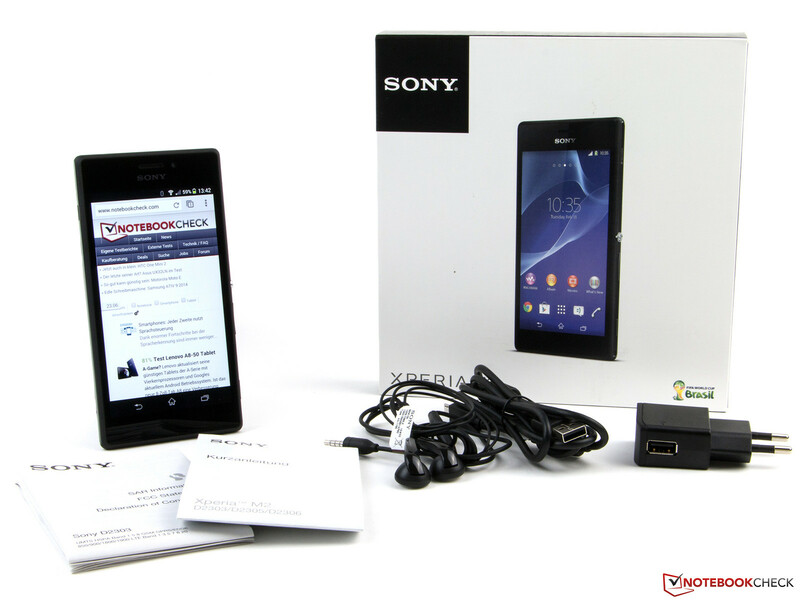 In the delivery, the Sony Xperia M2 comes with a data cable, a modular power adapter and a stereo headset. The manufacturer offers no accessories especially for the smartphone but there are a ton of universal accessories available, like better headphones and Bluetooth headsets, all available in the Sony store. 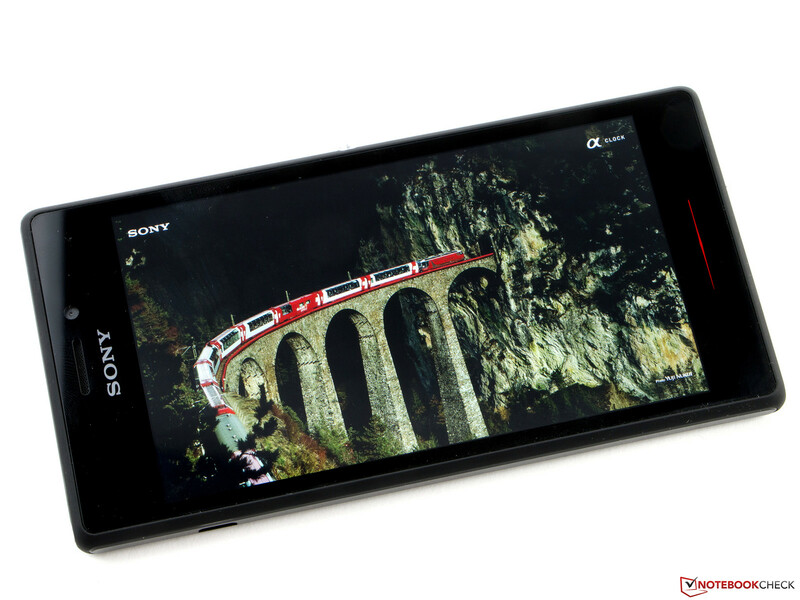 Sony ensures the Xperia M2 for 24 months. The battery and the accessories have a 6-month warranty. As in all smartphones, the capacitive touchscreen is the main input device. 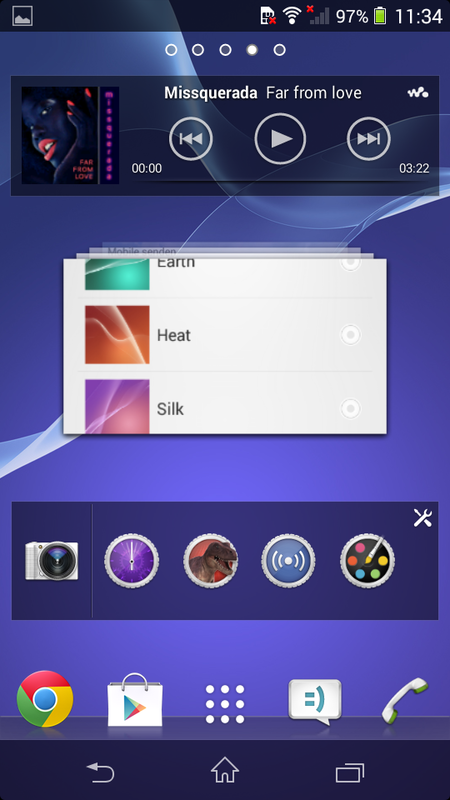 The screen recognizes finger input accurately and can even differentiate between two closely pressed together fingers. There is nothing to complain about, not even near the borders. 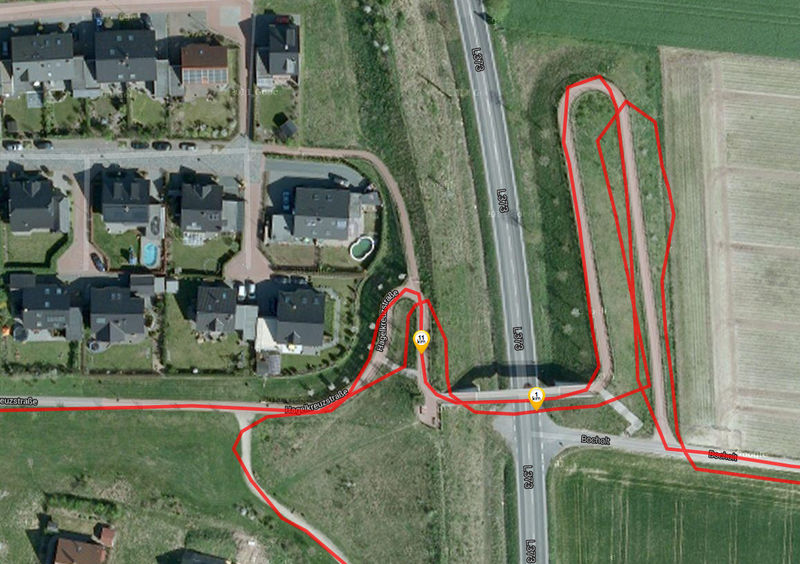 The input is quickly and reliably executed. 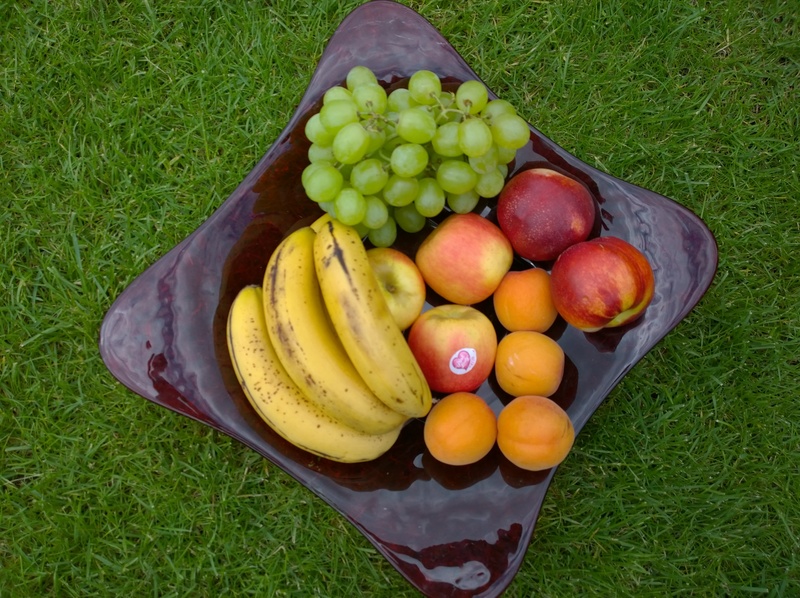 The sliding properties of the surface could be better, but it is quite good. 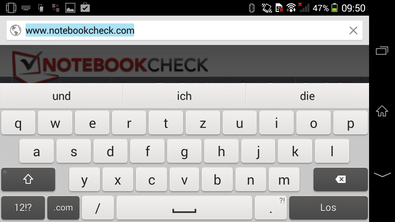 The virtual keyboard offers enough space even in portrait mode and is kept simple. 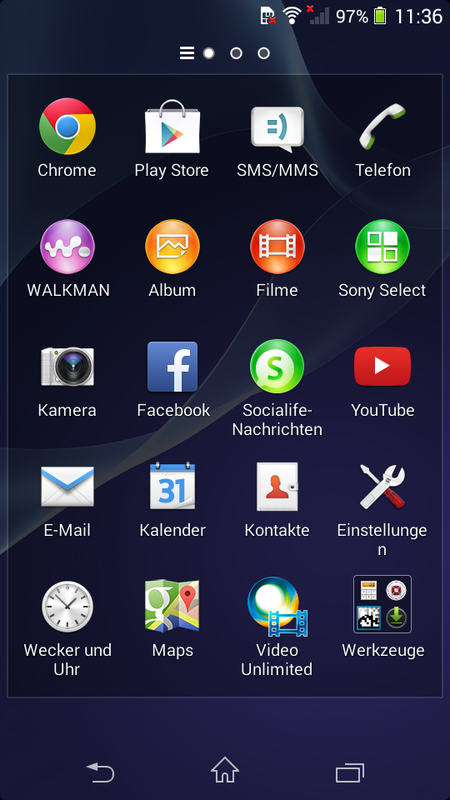 It requires a lot of space due to the on-screen buttons of the operating system. 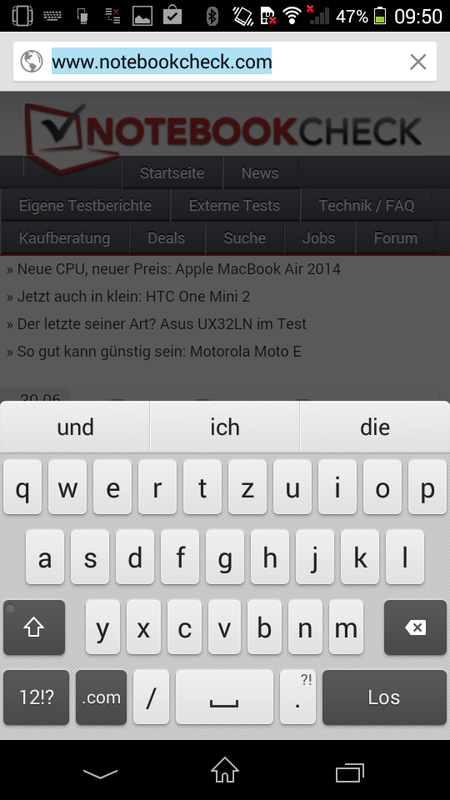 As such, barely any content is visible in landscape mode. The vibration of the smartphone provides good haptic feedback. 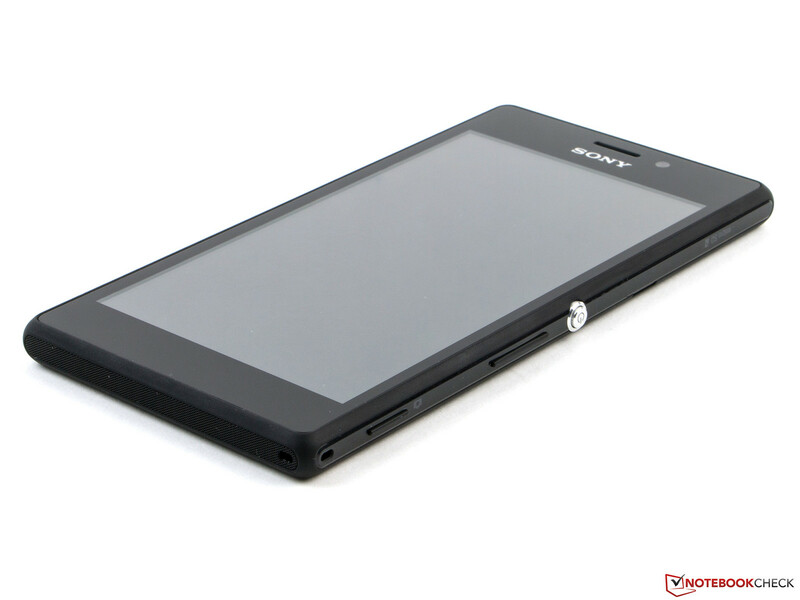 The display of the Sony Xperia M2 is 4.8-inches big and has a 960x540 pixels resolution. 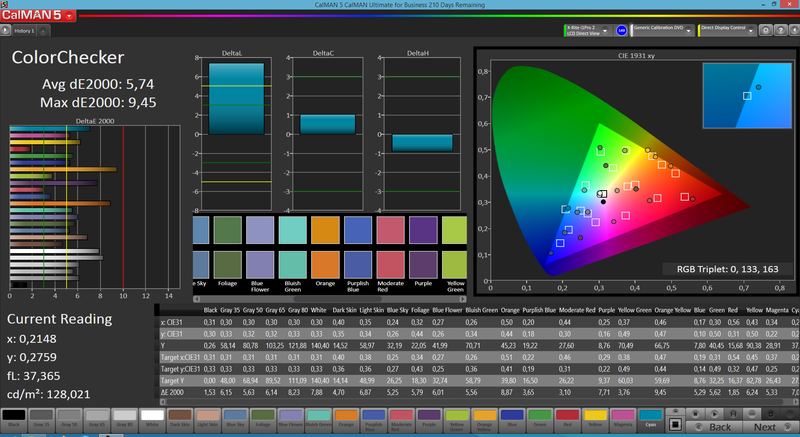 This results in a ratio of 16:9 and a pixel density of around 230 ppi. This is not very high and small captions seem very pixelated. However, the other competitors of this price class do not employ higher resolution panels. 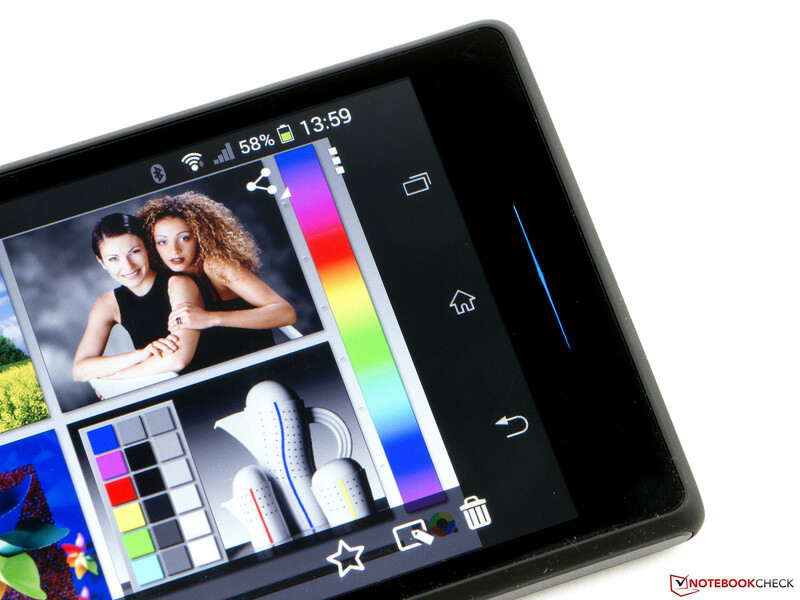 Only the Zopo ZP1000 can offer a HD panel for this price. In comparison to others, the M2 is the brightest smartphone: up to 483 cd/m² and a very good illumination of 93%. Only the Zopo (max. 511 cd/m², 90%) is slightly brighter. We did not detect any "bleeding" effects in the display. 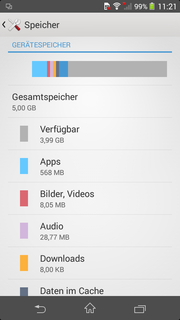 The black value of the Sony Xperia M2 is quite high: around 1 cd/m². This makes a subjective difference as well: black seems dark gray or anthracite. Due to the high black value, the contrast of 519:1 is not so good. The LG G2 Mini (0.38 cd/m², 879:1) and the Galaxy Core (0.45 cd/m², 916:1) perform much better. 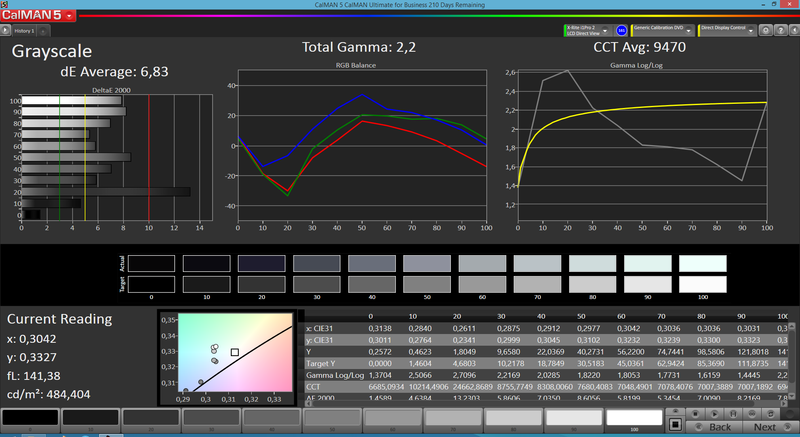 The color accuracy and saturation lie at a decent level and show no significant distortions. The gray levels show a different story: at 20%, we see a visible deviation which leads to a pink tinge. Otherwise, the RGB balance is dominated slightly by the green value, which leads to a slight green tinge, which was not disturbing in use. 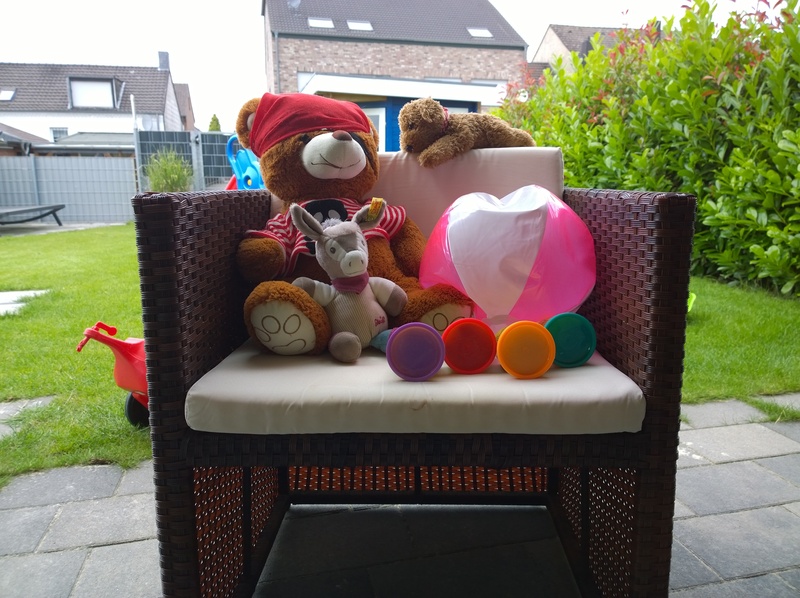 Outdoors, the weak contrast of the Sony Xperia M2 is noticeable as barely anything is visible on the screen in direct sunlight. Furthermore, even the high brightness cannot compensate for this. In bright surroundings, the user will be strained to make out anything on the panel. In a shaded area, the screen performs well. In the sunlight, it is hard to recognize anything. 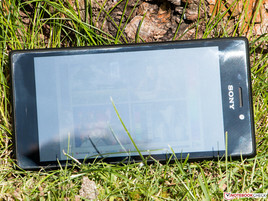 The Sony Xperia M2 uses like its big brother, the Xperia Z2, a TFT screen. In comparison to the predecessor, the viewing-angle stability is significantly better. At a flat diagonal angle, we notice a slight color inversion of black. At an angle of 45 degrees, the saturation of the colors is a little less, as if a gray tinge had covered the panel. 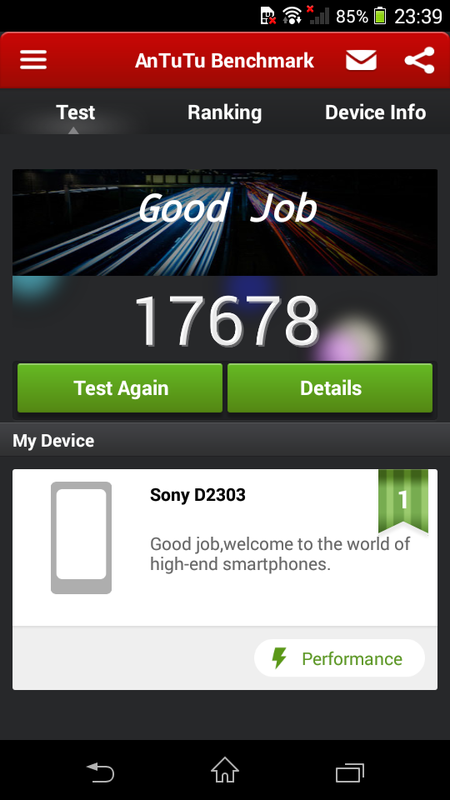 The Sony Xperia M2 uses a Qualcomm Snapdragon 400 MSM892 with four cores, which run at 1.2 GHz. The clock speed has risen by 200 MHz in comparison to the predecessor and the number of cores has doubled. 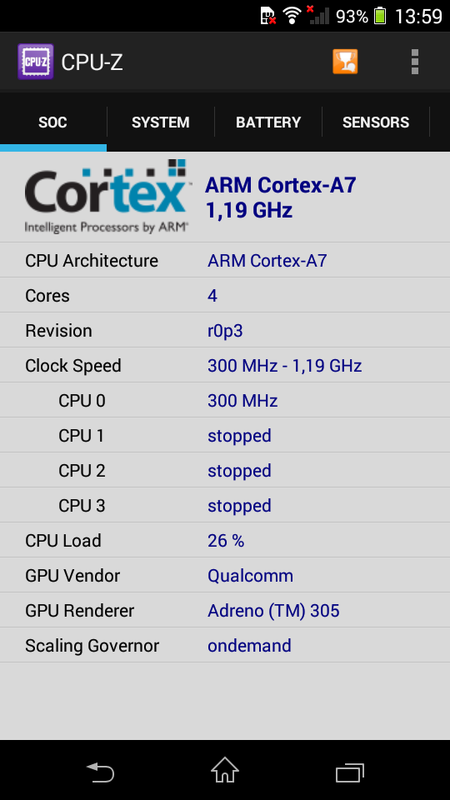 The Qualcomm Adreno 305 IGP has stayed the same. 1 GB of RAM is appropriate. 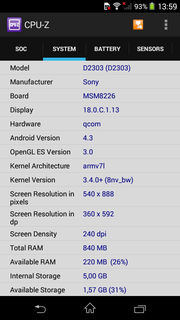 The available performance runs Google Android 4.3 well, even though sometimes there are some stutters. The test model performs well in the benchmarks, as not all competitors have a quad-core CPU. 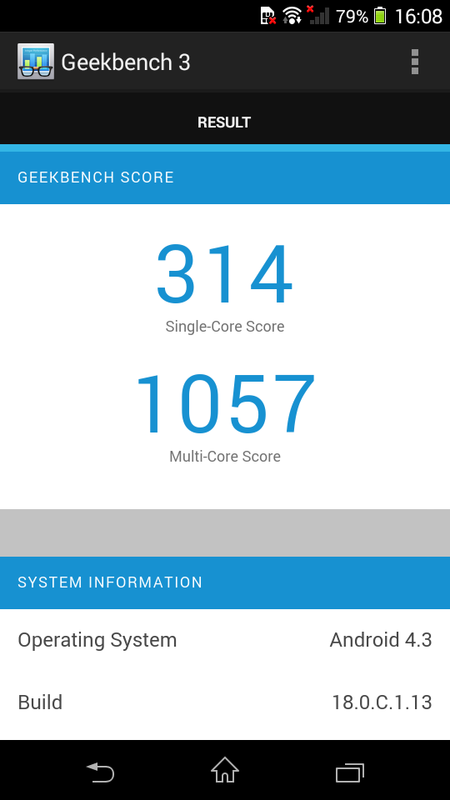 Only the Zopo ZP1000 can compete in that aspect with its octa-core CPU, and it proves itself stronger in the AnTuTu v4 benchmark. 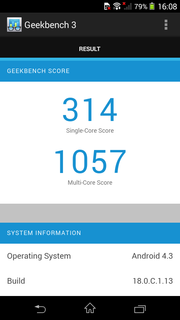 The HTC Desire 610 and the LG G2 Mini use the same SoC as the smartphone from Sony and lie at the same level in all benchmarks. 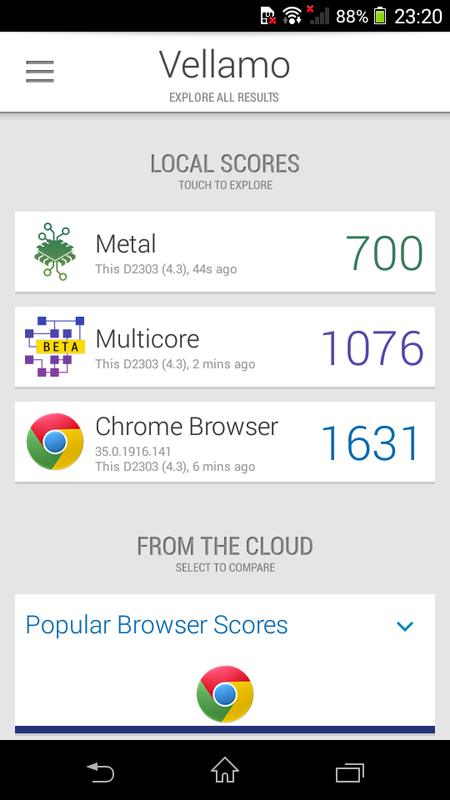 Subjectively, the browser speed of the Sony Xperia M2 is quite fast with Google Chrome (Version 35). 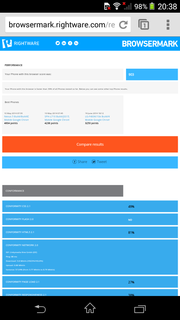 From the benchmarks, we get a mixed impression: while in the WebXPRT 2013, the M2 dominates the competition, in SunSpider 1.0 it is at the very rear. In Peacekeeper, both the Desire 610 and the LG G2 Mini are 23-25% faster although they use the same processor. 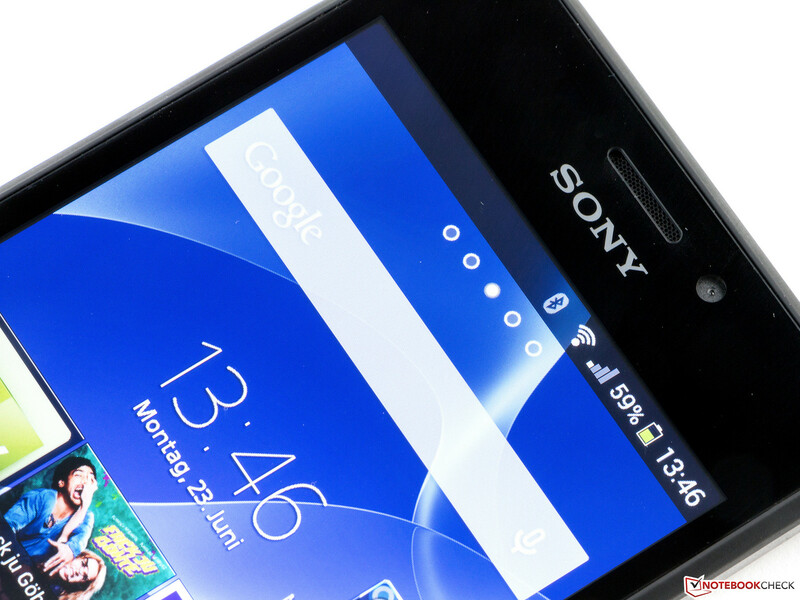 The Sony Xperia M2 has an 8 GB large eMMC storage. At the start, a mere 4 GB is available but this can be extended by up to 32 GB using a MicroSD card. 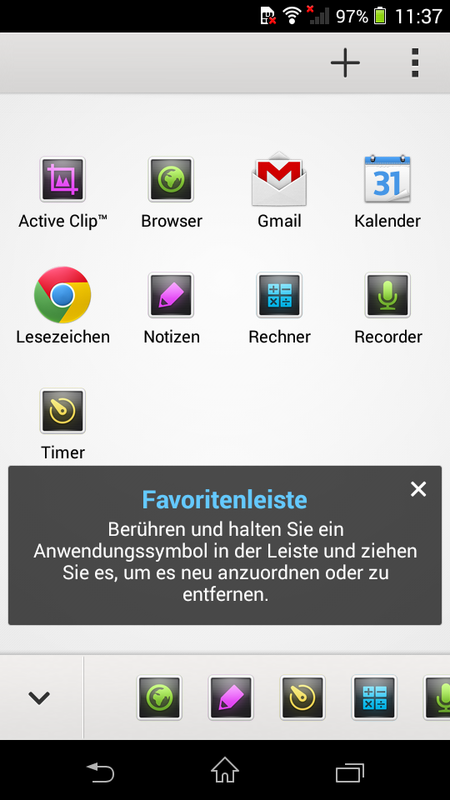 Unfortunately, the device does not support App2SD, which means that applications cannot be moved onto the memory card. The speed of the memory is quite good. The M2 is amazing at reading data and performs at 124 MB/s, which is the best for its category. The test model achieves 13.7 MB/s even while reading small files, and it is only slow when writing. 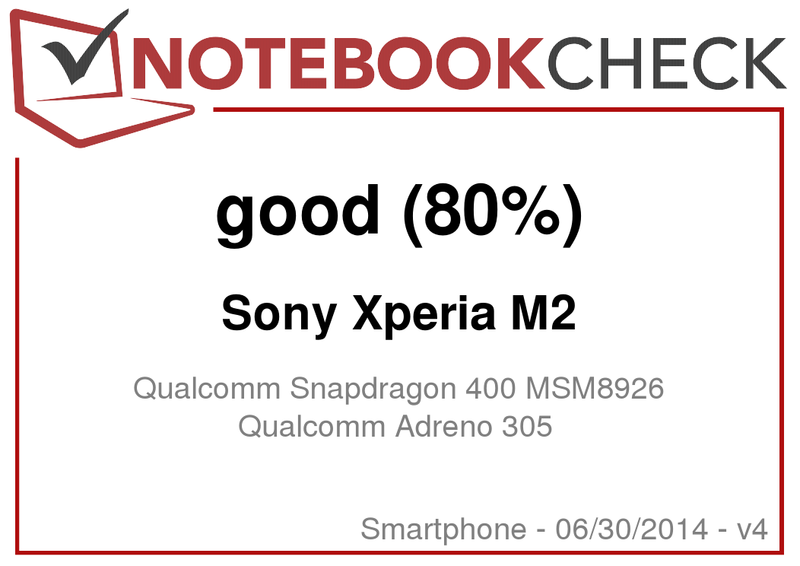 The Qualcomm Adreno 305 is used in the Sony Xperia M2 which is a good middle-class GPU, capable of running any game from the Google Play Store. 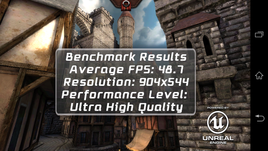 Of course, with demanding games, the graphics settings need to be adjusted to allow for fluid performance. 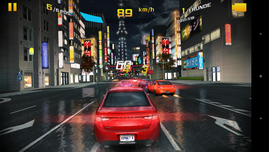 For example, Asphalt 8: Airborne runs fluidly at medium details. If the max settings are applied, the game will crash. 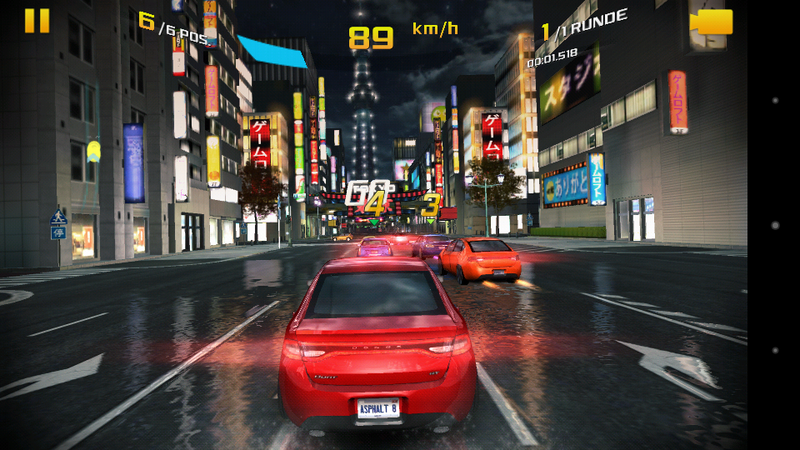 Asphalt 8 runs fluidly at medium settings. The good results in Epic Citadel are mainly due to the low resolution. 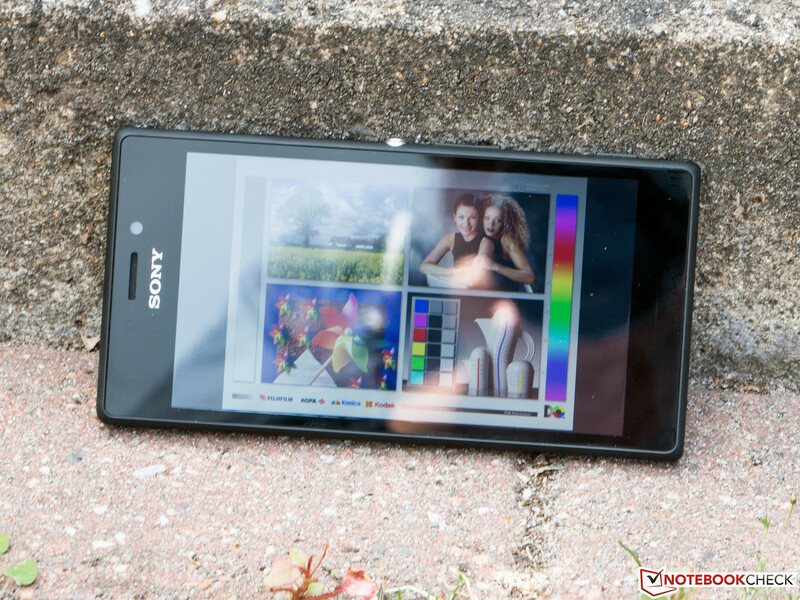 The Sony Xperia M2 hits a surface temperature of 34.0 °C while idle. At load, which we simulated using the Stability Test app, the temperatures hit a max of 40.4 °C. 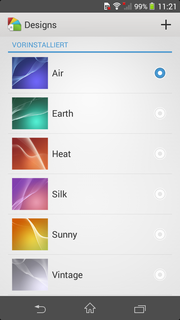 The smartphone gets noticeably warm but not disturbingly so. The Nokia Lumia 630 (max. 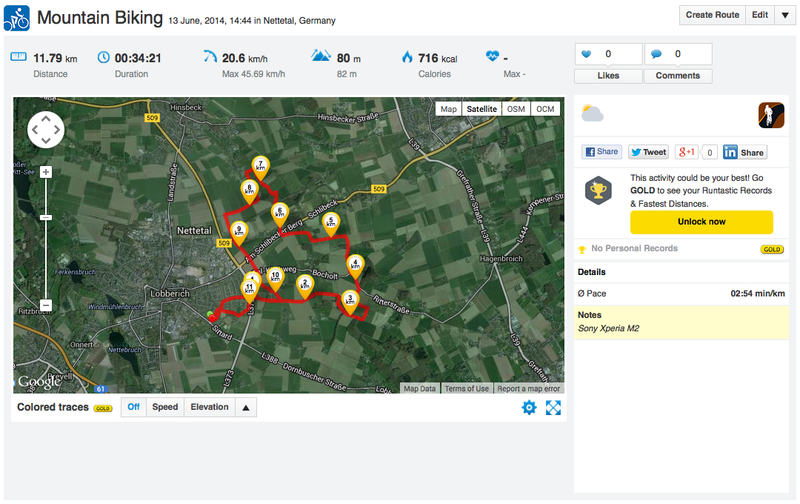 43.1 °C) runs a little hotter. The LG G2 Mini (max. 34.4 °C) is the coolest device in this comparison. The M2 is the only Android device which hits the 40 °C mark. 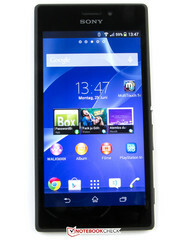 Even the Zopo ZP1000 (max. 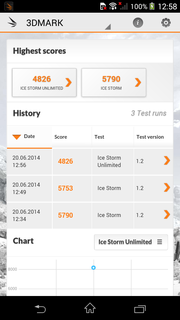 37.5 °C) with its octa-core CPU stays well below this limit. 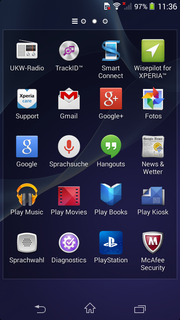 The internal speakers of the Sony Xperia M2 are mediocre. The positioning is not optimal as in landscape mode; the user might accidentally block the speakers. Bass and middle notes are noticeable but very thin. The high notes are slightly dull. Overall, a decent sound output which starts to get distorted once we pass the 80% volume level. The included headphones are great. They offer relatively good sound with strong bass and clean high notes. At max volume, the sound stays pure without any distortions. 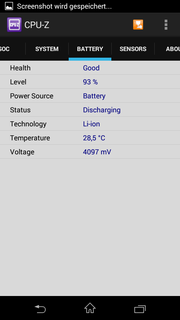 The power consumption of the Sony Xperia M2 is great. 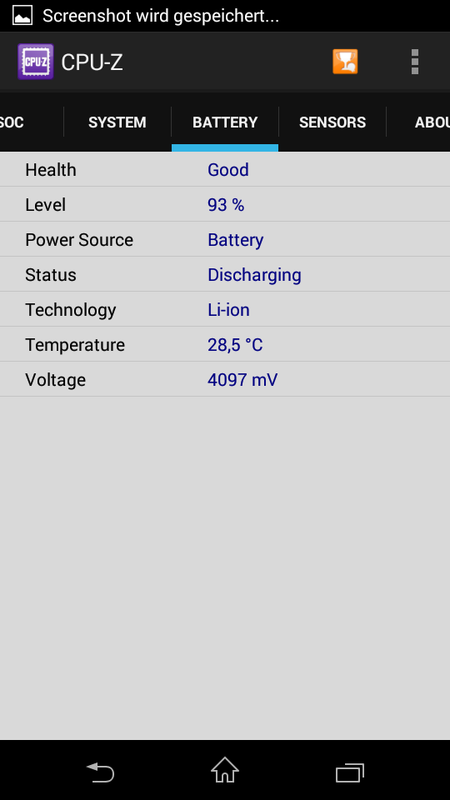 While idle, the device requires between 0.7 and 1.5 W. This places the device between the LG G2 (0.4–1.0 W) and the HTC Desire 610 (0.8–1.9 W). 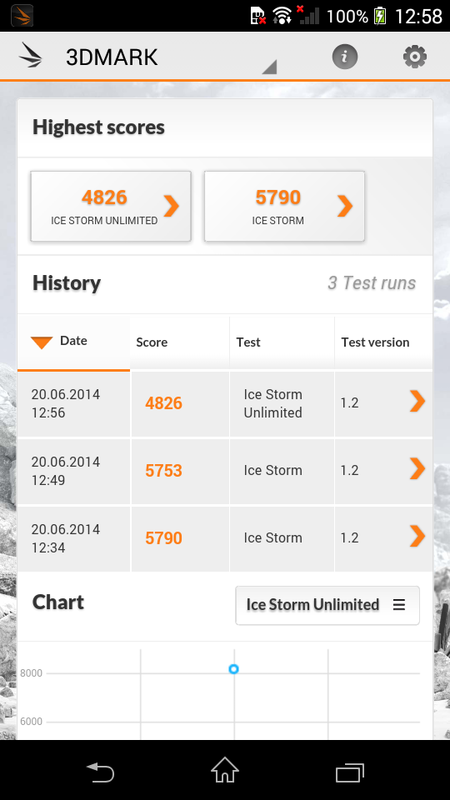 At load, the device is very conservative, consuming a max of 3.2 W. Only the dual-core devices and the LG G2 Mini (max. 2.4 W) are a little less power-hungry. The battery offers a capacity of 2,330 mAh and is very well-dimensioned. 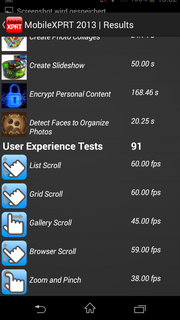 The max runtime was recorded while running at minimum brightness. For this test, we turn off all the wireless devices besides the WLAN and let a browser run a script which simulates reading a book. The device lasts over 25 hours. However, in the minimum runtime test, the system runs with all modules on and at max brightness. 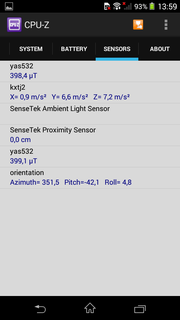 The Stability Test app ensures constant load on the system. With around five hours the test model achieves a good result. 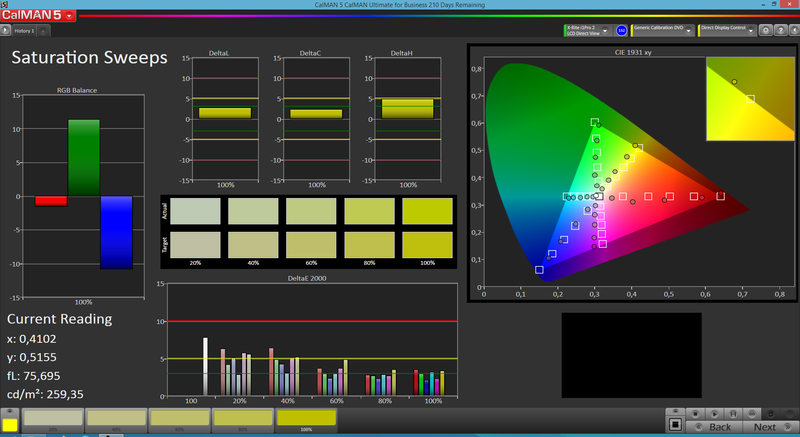 A better result is achieved with adjusted brightness of 150 cd/m². 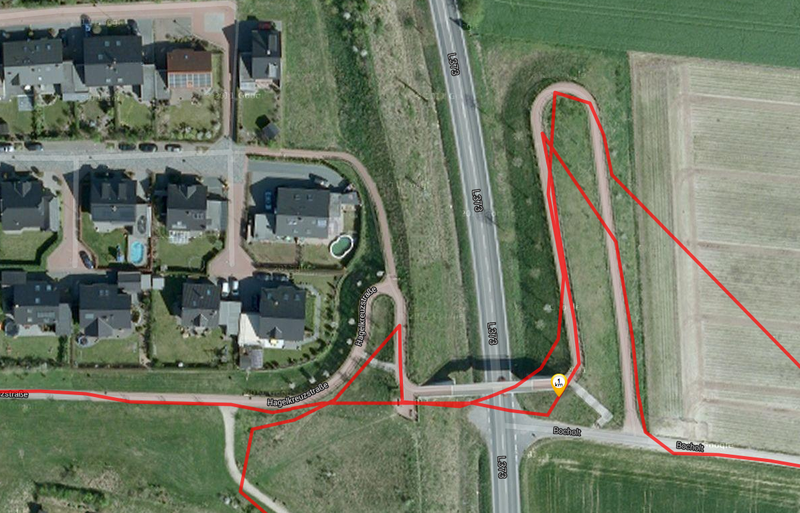 In the test "surfing via WLAN" we turn all modules, aside from the WLAN, off again. Then the M2 runs a browser script which loads a new website every 40 seconds. The device lasts over 11 hours in this test. 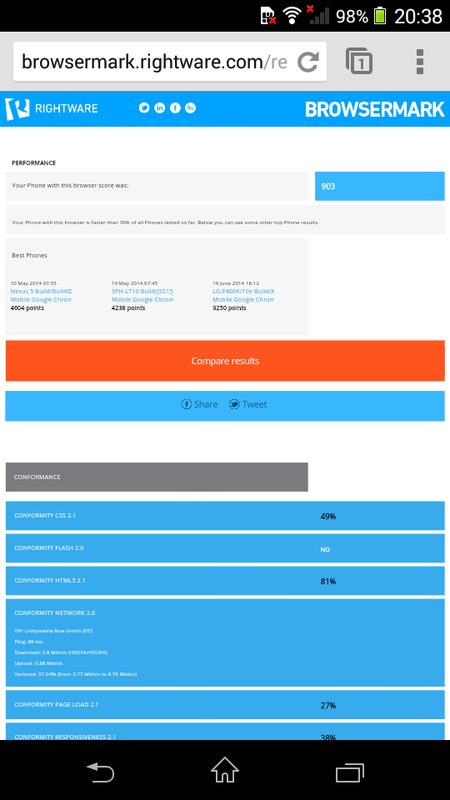 Only the LG G2 Mini (16:43 h) and the Lumia 630 (14:34 h) can compete. Looped playback of Full HD videos allows us to see how long the device lasts while watching videos. 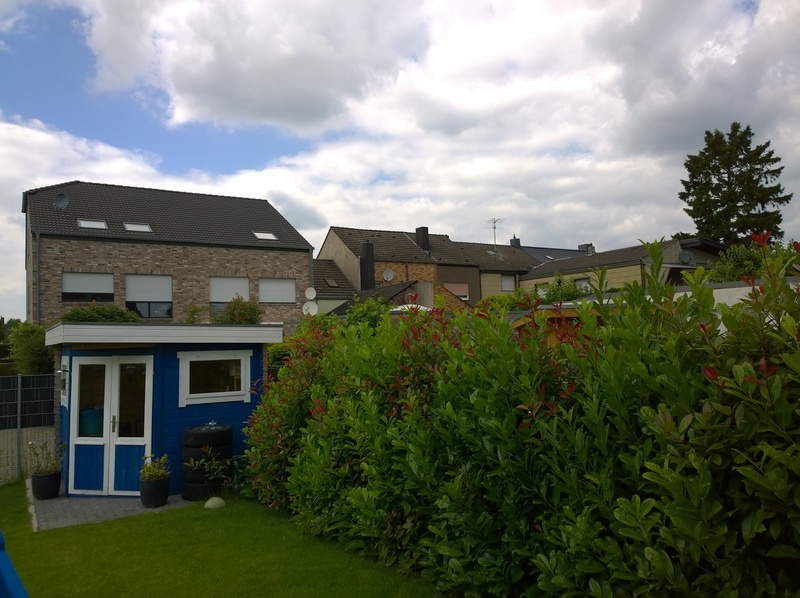 In this test, the device does not perform as well and the Lumia 630 (12:16 h) can surpass it. The Sony Xperia M2 is a good middle-class smartphone, which scores in terms of communication. Despite the decidedly average speech quality the device supports all the latest data standards including LTE Cat. 4. The frequency coverage is not meager either. The panel is very bright and has good illumination, but the contrast should have been better. The workmanship lies at a high level and can score thanks to features such as the glass back. The system speed is impressive, but it will be outpaced in the near future. In fact, the user already has to make compromises when playing the latest games. 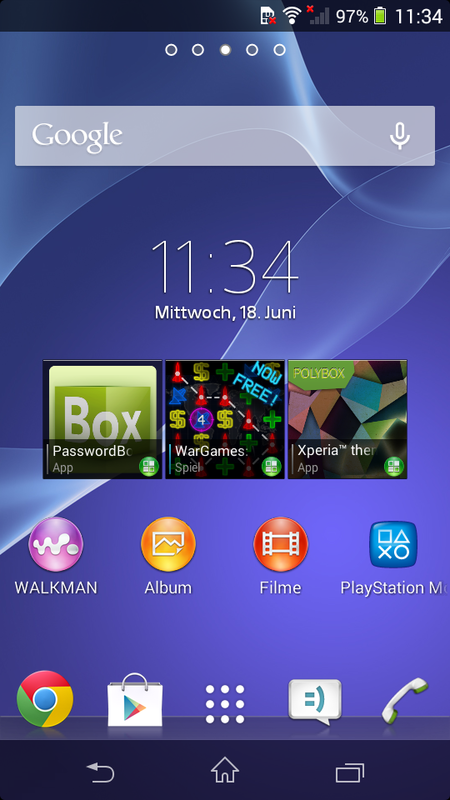 It is a little sad that Sony has no App2SD support. The quality of the camera should have been better and the artifacts in the details are very disturbing. We can only hope that Sony will release a software update to alleviate this flaw. 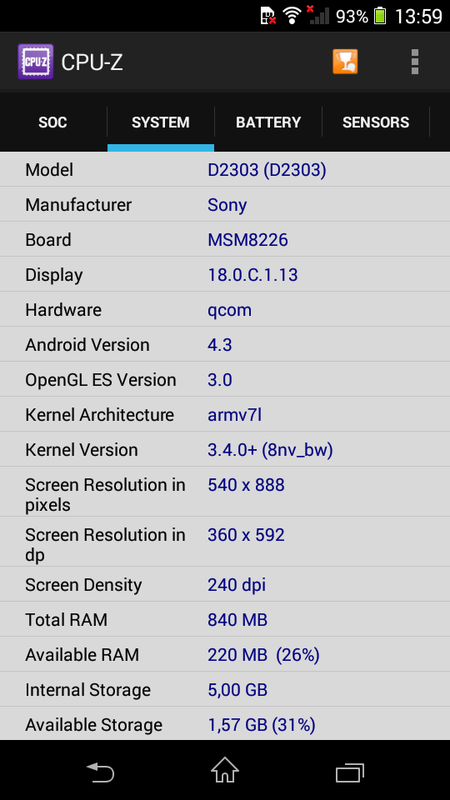 The battery life is also impressive and rounds the Sony Xperia M2 off well. The LG G2 Mini is definitely one of the hottest competitors, even without LTE. 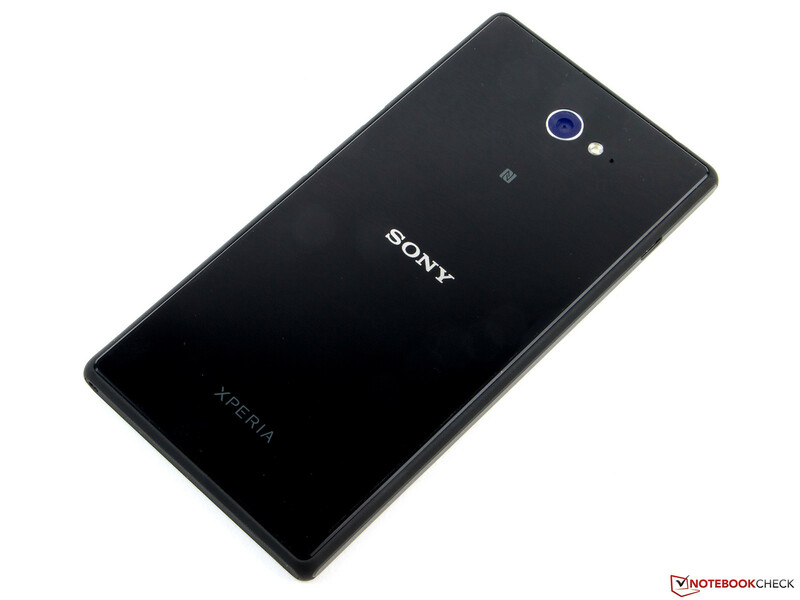 In Review: Sony Xperia M2. Test model provided by Redcoon. The delivery holds no surprises. The touchscreen is 4.8-inches large. The panel has a resolution of 960x540 pixels. 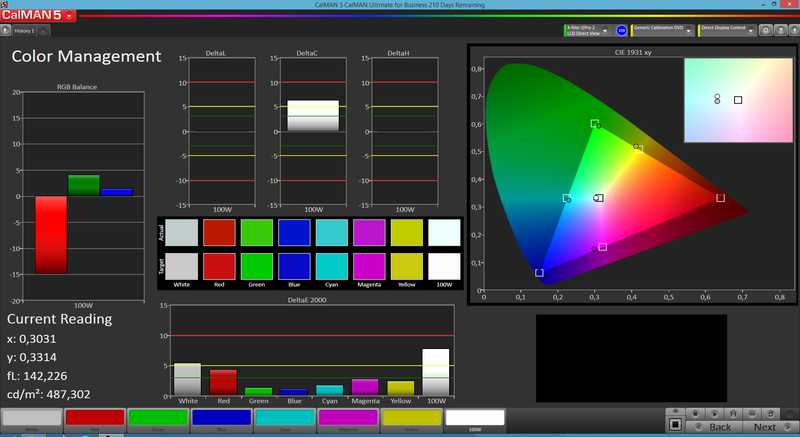 The TFT display is very bright. The keys are very high-quality and are easy-to-use. The back is made of glass. Micro-SIM and MicroSD slots are to be found below flaps. The notification LED is also included. It can be configured to light up in many different colors. 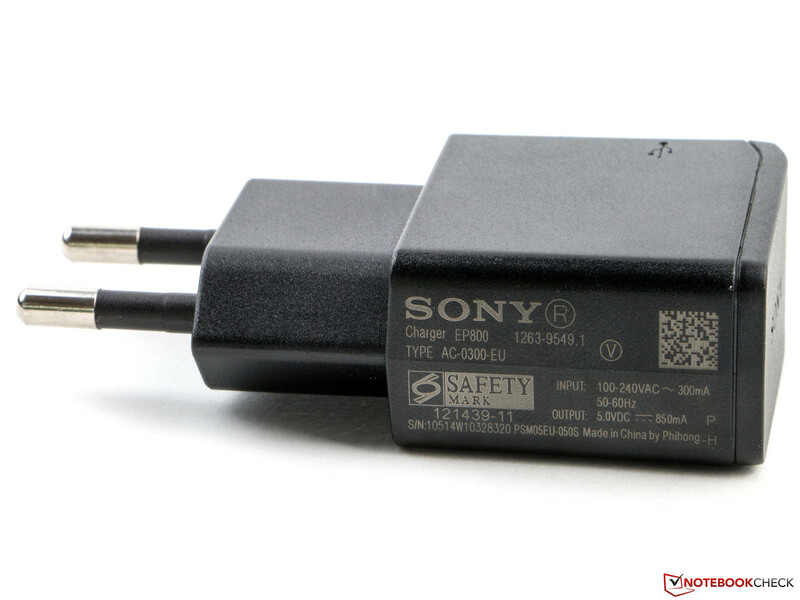 The modular power adapter has a 4.25 W power output. 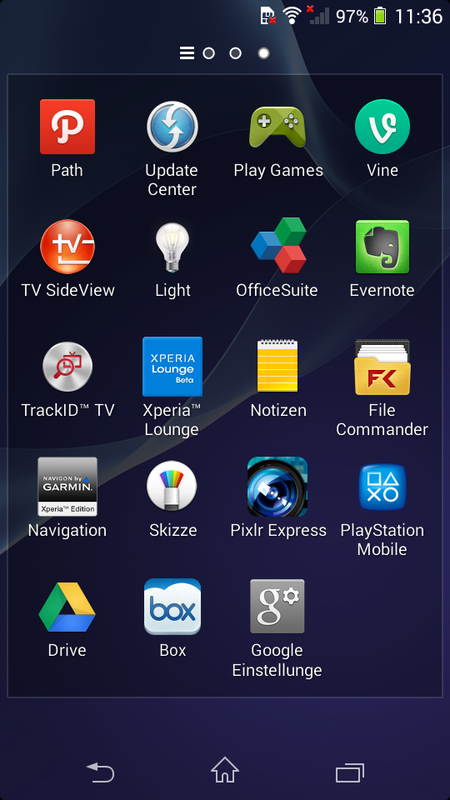 The mini apps can be sorted. The various options to get an Internet connection are ideal and are hard to find in most devices, even in those which are more expensive than our test model. From the display size, we would expect a higher resolution. Such a high black value is surprising. The competitors are: LG G2 Mini, HTC Desire 610, Acer Liquid E3, Zopo ZP1000, Nokia Lumia 630 and Samsung Galaxy Core LTE.